We’ve stayed twice at the Hotel Jerome over the past three years. Once in low season and this time in high season. Unfortunately, our hearts weren’t won over either time. Owned by Rock Resorts, it’s a 4-Diamond AAA property. How they earn that award, we’re not sure. There are many better options for places to stay in this price range or less. Location: Hotel Jerome is located on Aspen’s Main Street. If you’re unfamiliar with Aspen, the most popular part of town sits on one side of Main Street. 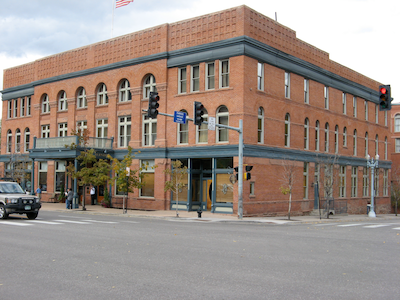 Everything from Hotel Jerome is within walking distance. Ajax Mountain, the main ski mountain in Aspen is about a 10 minute walk of 7-8 blocks. The hotel offers free transportation to and from the mountain. Rooms: One positive thing that the Jerome has going for it is room size. 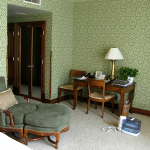 Even standard rooms are around 500 sq feet, so there’s plenty of room to spread out. The original part of the hotel was built in 1889. In the early 1980s, a wing with additional rooms and ballrooms were added. Rooms are available in both sections of the hotel. 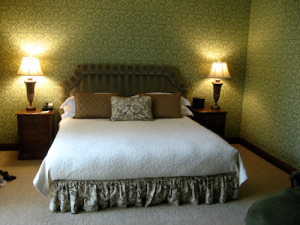 Rooms are appointed in Victorian style, as is the rest of the hotel. The look and feel of the rooms is not for everyone. Rooms have tons of storage space, both in the form of closets and dressers. Furniture and beds are “well worn”. The bathrooms are large and well appointed. Luckily, the hotel has added flat screen hotels in every room to at least attempt to look somewhat updated. We found out the hard way that heating and air conditioning in the hotel are “seasonal”. If you’re there during a warm day in the Spring, you won’t have AC. Stay there during a cold spell in the Summer and you won’t have heat. Facilities: The hotel has an average sized pool and two small outdoor jacuzzis, all surrounded by a large deck. There are two bars located inside the hotel, The Library, a small, quiet bar and the J-Bar, which has a more sports bar feel. Breakfast, lunch and dinner is served in the Garden Terrace. We ate breakfast on one day and it was just OK. A small, simple buffet was $15. Based upon what you received for the money, it was a bit overpriced, even by Aspen standards. Valet parking is available. Staff: Front desk and valet staff were very nice. They were always willing and able to help with any request. Service was better in the J-Bar during this visit than our previous one. Other: While the hotel bills itself as a “resort”, don’t be misled. It’s a basic hotel. They may choose to call it a resort so they can charge you a $30 daily “resort fee”. We hate “add-on”fees. Just include it in the rate. What do you get for the $30 per day? Valet parking, internet access, use of the business center and in-town transportation. Pros: Large rooms and friendly service. Cons: An old, tired hotel on the edge of town of 3 star quality with 5+ star pricing. When we saw the Jerome on Jetsetter, we thought we’d give it another try. When your in the price range, even with the substantial discount, there are many better alternatives in Aspen that are closer to the ski area, as well as being in the heart of the popular places in town. While the service at the Jerome was good, other hotels go above and beyond. Next time, we’ll put our money elsewhere. If you want a good nights rest, make sure you request a room far away from the ball room/conference area.